This past June, the Meadowbrook LOOK blog featured a short story (Camas ‘Sea of Blue’ SEE!) 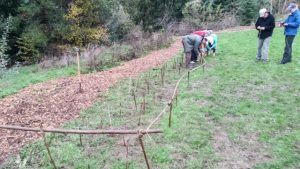 on the planting of blue camas in a small area of the MCGO. A native bulb, it was once a diet staple of early Americans, prior to European arrivals. The idea of seeing a blue feature from afar, that was, at first, thought to be a body of water, is intriguing. 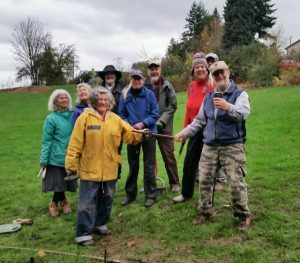 When reintroducing it here, the Meadowbrook Orchard, the thought was, ‘what a great conversation plant to welcome the neighbor, guest, visitor or even newly arrived citizen.’ The recent expansion of the area mentioned last June, was on a very wet, Fall day. A checkerboard pattern was agreed upon by the group. Just being able to stay standing was a chore, as wet conditions are set at the bottom of a hill. It is for this very reason this planting occurred. 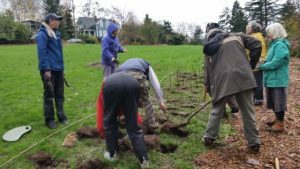 Seattle Parks cannot easily maintain this portion, so mulching and alternative planting have been a part of the conversation with Seattle Parks Head Gardener. Once the bulbs were securely planted, MCGO gardeners placed a makeshift bamboo fence in front. Not to disturb the little tubers is the primary intent. Weeks later, a more sturdy option was installed. With plenty of room to spread, the story be told, this historic plant was a yummy treat and pretty to cast an eye!